When the “Forward” pushbutton is actuated, M1 will energize, closing the normally-open auxiliary contact in parallel with that switch. 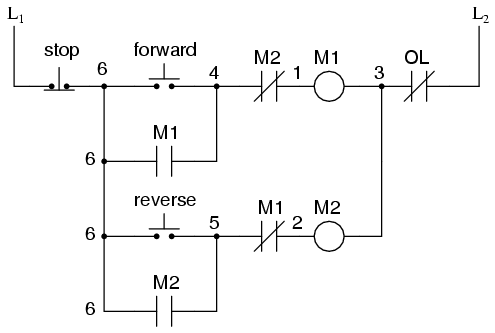 When the pushbutton is released, the closed M1 auxiliary contact will maintain current to the coil of M1, thus latching the “Forward” circuit in the “on” state. The same sort of thing will happen when the “Reverse” pushbutton is pressed. These parallel auxiliary contacts are sometimes referred to as seal-in contacts, the word “seal” meaning essentially the same thing as the word latch. Now, if either forward or reverse circuits are latched, they may be “unlatched” by momentarily pressing the “Stop” pushbutton, which will open either forward or reverse circuit, de-energizing the energized contactor, and returning the seal-in contact to its normal (open) state. The “Stop” switch, having normally-closed contacts, will conduct power to either forward or reverse circuits when released. So far, so good. Let’s consider another practical aspect of our motor control scheme before we quit adding to it. If our hypothetical motor turned a mechanical load with a lot of momentum, such as a large air fan, the motor might continue to coast for a substantial amount of time after the stop button had been pressed. This could be problematic if an operator were to try to reverse the motor direction without waiting for the fan to stop turning. If the fan was still coasting forward and the “Reverse” pushbutton was pressed, the motor would struggle to overcome that inertia of the large fan as it tried to begin turning in reverse, drawing excessive current and potentially reducing the life of the motor, drive mechanisms, and fan. What we might like to have is some kind of a time-delay function in this motor control system to prevent such a premature startup from happening. Let’s begin by adding a couple of time-delay relay coils, one in parallel with each motor contactor coil. If we use contacts that delay returning to their normal state, these relays will provide us a “memory” of which direction the motor was last powered to turn. What we want each time-delay contact to do is to open the starting-switch leg of the opposite rotation circuit for several seconds, while the fan coasts to a halt. If the motor has been running in the forward direction, both M1 and TD1 will have been energized. This being the case, the normally-closed, timed-closed contact of TD1 between wires 8 and 5 will have immediately opened the moment TD1 was energized. When the stop button is pressed, contact TD1 waits for the specified amount of time before returning to its normally-closed state, thus holding the reverse pushbutton circuit open for the duration so M2 can’t be energized. When TD1 times out, the contact will close and the circuit will allow M2 to be energized, if the reverse pushbutton is pressed. In like manner, TD2 will prevent the “Forward” pushbutton from energizing M1  ntil the prescribed time delay after M2 (and TD2) have been de-energized. 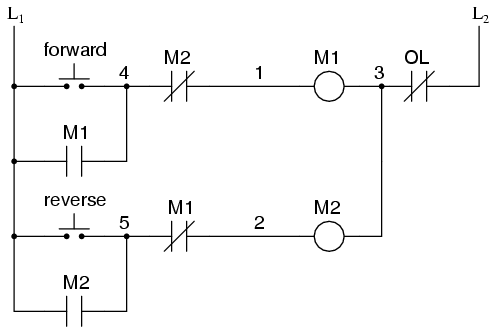 Motor contactor (or “starter”) coils are typically designated by the letter “M” in ladder logic diagrams. Continuous motor operation with a momentary “start” switch is possible if a normally-open “seal-in” contact from the contactor is connected in parallel with the start switch, so that once the contactor is energized it maintains power to itself and keeps itself “latched” on. Logic circuits, whether comprised of electromechanical relays or solid-state gates, can be built in many different ways to perform the same functions. 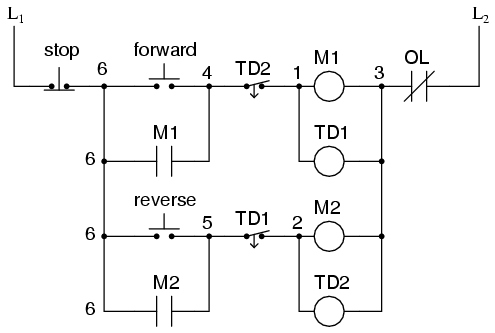 There is usually no one “correct” way to design a complex logic circuit, but there are usually ways that are better than others. 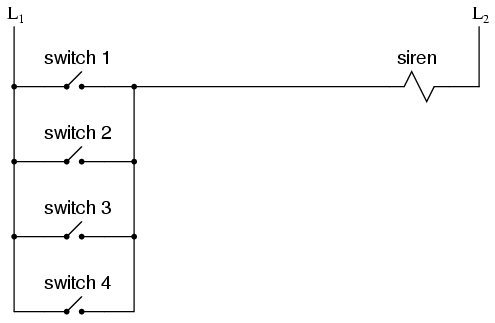 Essentially, this is the OR logic function implemented with four switch inputs. 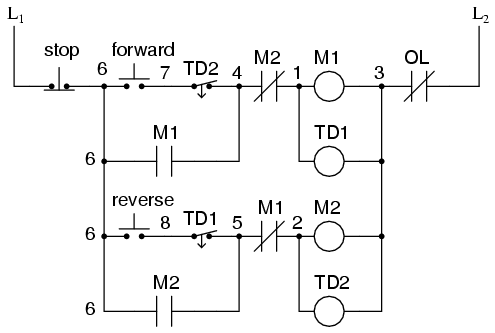 We could expand this circuit to include any number of switch inputs, each new switch being added to the parallel network, but I’ll limit it to four in this example to keep things simple. At any rate, it is an elementary system and there seems to be little possibility of trouble. Granted, the circuit is more complex than it was before the addition of the control relay, and the system could still fail in the “silent” mode with a broken connection in the bottom rung, but its still a safer design than the original circuit, and thus preferable from the standpoint of safety. This design of circuit is referred to as fail-safe, due to its intended design to default to the safest mode in the event of a common failure such as a broken connection in the switch wiring. Fail-safe design always starts with an assumption as to the most likely kind of wiring or component failure, and then tries to configure things so that such a failure will cause the circuit to act in the safest way, the “safest way” being determined by the physical characteristics of the process. Take for example an electrically-actuated (solenoid) valve for turning on cooling water to a machine. Energizing the solenoid coil will move an armature which then either opens or closes the valve mechanism, depending on what kind of valve we specify. A spring will return the valve to its “normal” position when the solenoid is de-energized. We already know that an open failure in the wiring or solenoid coil is more likely than a short or any other type of failure, so we should design this system to be in its safest mode with the solenoid de-energized. If its cooling water we’re controlling with this valve, chances are it is safer to have the cooling water turn on in the event of a failure than to shut off, the consequences of a machine running without coolant usually being severe. This means we should specify a valve that turns on (opens up) when de-energized and turns off (closes down) when energized. This may seem “backwards” to have the valve set up this way, but it will make for a safer system in the end. One interesting application of fail-safe design is in the power generation and distribution industry, where large circuit breakers need to be opened and closed by electrical control signals from protective relays. If a 50/51 relay (instantaneous and time overcurrent) is going to command a circuit breaker to trip (open) in the event of excessive current, should we design it so that the relay closes a switch contact to send a “trip” signal to the breaker, or opens a switch contact to interrupt a regularly “on” signal to initiate a breaker trip? 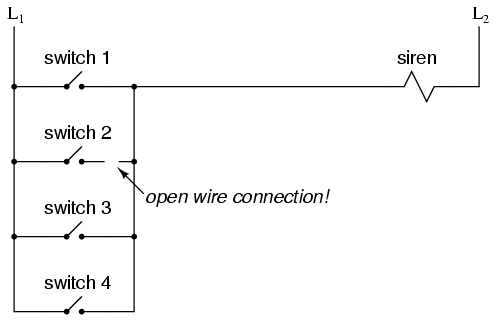 We know that an open connection will be the most likely to occur, but what is the safest state of the system: breaker open or breaker closed? At first, it would seem that it would be safer to have a large circuit breaker trip (open up and shut off power) in the event of an open fault in the protective relay control circuit, just like we had the fire alarm system default to an alarm state with any switch or wiring failure. However, things are not so simple in the world of high power. To  ave a large circuit breaker indiscriminately trip open is no small matter, especially when customers are depending on the continued supply of electric power to supply hospitals, telecommunications systems, water treatment systems, and other important infrastructures. For this reason, power system engineers have generally agreed to design protective relay circuits to output a closed contact signal (power applied) to open large circuit breakers, meaning that any open failure in the control wiring will go unnoticed, simply leaving the breaker in the status quo position. Is this an ideal situation? Of course not. If a protective relay detects an overcurrent condition while the control wiring is failed open, it will not be able to trip open the circuit breaker. Like the first fire alarm system design, the “silent” failure will be evident only when the system is needed. However, to engineer the control circuitry the other way — so that any open failure would immediately shut the circuit breaker off, potentially blacking out large potions of the power grid — really isn’t a better alternative. An entire book could be written on the principles and practices of good fail-safe system design. At least here, you know a couple of the fundamentals: that wiring tends to fail open more often than shorted, and that an electrical control system’s (open) failure mode should be such that it indicates and/or actuates the real-life process in the safest alternative mode. These fundamental principles extend to non-electrical systems as well: identify the most common mode of failure, then engineer the system so that the probable failure mode places the system in the safest condition. The most common type of wiring and component failure is an “open” circuit, or broken connection. Therefore, a fail-safe system should be designed to default to its safest mode of operation in the case of an open circuit.